Car accidents, break downs and repairs can cause a major financial setback if you don’t have the right amount of insurance. In order to be adequately protected, you need a comprehensive car insurance plan with sufficient riders and affordable premium. To do this, you need to know exactly what you’re paying for. That’s where IDV comes into the picture. Simply put, IDV is the current market value of your vehicle. IDV refers to the highest sum payable by the insurer for a vehicle insurance policy. It is thus the maximum amount you can claim in case of total loss or total constructive loss of your vehicle, or in case it gets stolen or damaged beyond repair, within the policy period. For instance, if your vehicle’s market value is fixed at Rs. 7 lakhs at the start of the policy, the maximum amount the insurance company will compensate you will be Rs. 7 lakhs. The insurance premium payable is directly proportional to the IDV. Hence, as your vehicle ages, the premium decreases. IRDAI (Insurance Regulatory and Development Authority of India) policy states that the maximum declared value for your vehicle can be 95% of its former showroom price. Hence, within six months of purchase, the value of your vehicle depreciates by 5%. As explained above, the IDV can fall within a certain range based on the ex-showroom price that your insurer has considered. As the owner of the vehicle, not knowing the correct IDV of the vehicle might result in you receiving an inadequate compensation. 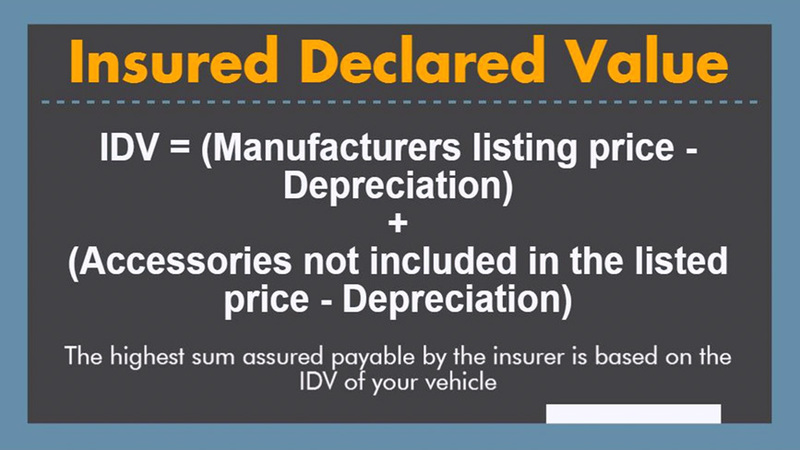 It’s better not to understate the IDV by quoting a figure that is lower than the actual market value of your vehicle, because though this would mean you may have to pay lesser premium, it also means you will get lesser insurance cover. Similarly, don’t overstate the IDV thinking that the claim amount will consequently increase. A higher IDV will not necessarily fetch you a higher price when you are selling your vehicle. Also, please note that while the claim depends on the IDV, it is also influenced heavily by the type of loss. Now that you are aware of what IDV means and implies, check out 6 Motor Insurance Terms You Must Know Before You Claim. Looking for some specific information regarding Car Insurance? Let us know in the comments and we’ll get back to you. Related: Are you smarter than your insurance agent?